Recently, we painted our the beat-up, thick wood trim in our 77 year old home in hopes that it would brighten and update the space. And boy did it ever! 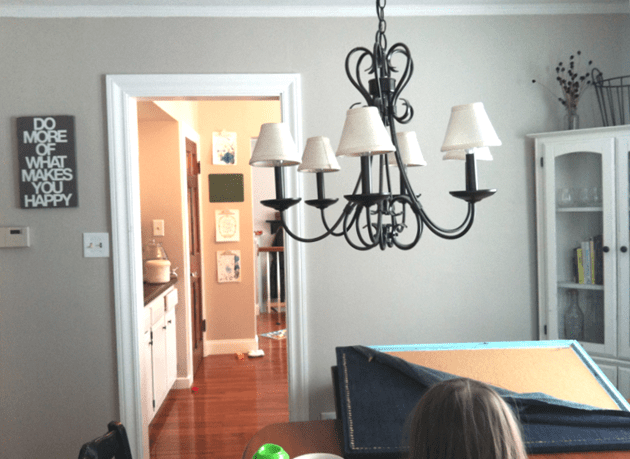 I’ve already shared the huge difference painting the trim made in our living room turned mom cave. I couldn’t believe the transformation the paint made in our dining room and wanted to share it, but I needed a little something in the wall art department. And yay, I finally figured it out this week, so here it is. I was struggling to find a piece for this space! I tried nothing, I tried lots of little somethings, I tried a huge honkin’ chalkboard (“16 days until Christmas” graced my board in January), but nothing worked. I hung this sign from my friend Pamela and loved it in the spot, but the other side still needed something else. I was stuck. On Monday, inspiration struck and I was in a project whirlwind. I saw the below picture pop up on my Instagram feed on Monday. 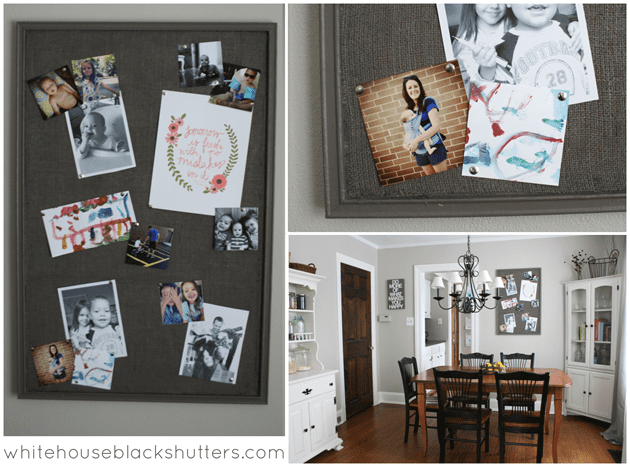 My friend Ashley at The Handmade Home shared it, her post was on Decorating with Photos and making a simple cork board, isn’t it lovely? I bundled up the kids (we have three under four) and ran to HD to have the sign color matched. I had a bulletin board in the attic that I had redone, but never truly loved, so I dug that out. On Tuesday, I got to work deconstructing the board in the hopes of painting it the same color as the sign. It was a bigger task than I had imagined. Remove 300 thumbtacks with needle nose pliers? I can do that. Peel off fabric? Okay, no biggie. Peel hot glue off of wood and cork? Uhhhhhh… HOT MESS. But I got there. And when I started painting the cork, and realized that paint just wasn’t going to cut it. I needed something to hide the bazillion holes and missing cork chunks that my sloppy DIY left behind. I racked my brain for something with texture and found it in my stash: burlap. I would paint the burlap. Did a little mock-up (above, right), and it was perfect. I was getting giddy. Painted the edges to hide the blue, cut the burlap to size, use adhesive to spray it down this time, and got painting. Between naps and meals and breaks all day, I got it done and hung last night. I added the “Tomorrow is Fresh with No Mistakes” print from my friend Lindsay, some Instagram photos, snips of kid artwork, and quick B&W prints from our printer. 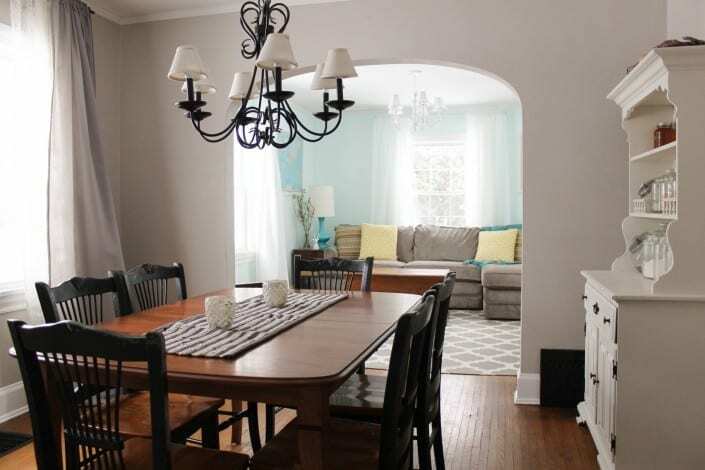 Here’s the before and after of our dining room. I really didn’t think we did that much in here until I saw this comparison (I always do that to myself). But if you’re thinking of painting your trim, this may make up your mind. Same room, same cheap painted hutches, same spray painted $5 chandelier, same thrifted table. We painted the walls an updated greige (MS Sharkey Gray) and the trim white (Valspar Bistro White), and added larger, more cohesive wall art. 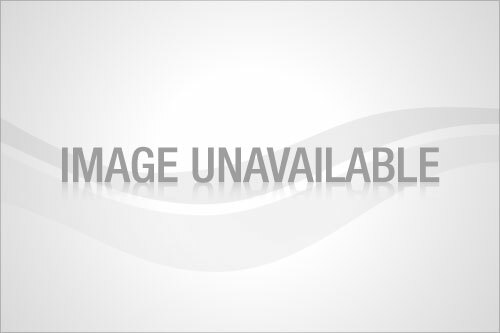 update: We sold our home in September 2014, here are the updated pictures we used in our listing! I love your board. I am trying to paint some burlap white for a bulletin board What type of paint did you use? What type of brush? How many coats of paint did it take? Please provide a few more step by step details? Also, did you use same paint for wood trim and burlap? Thank you for answering my questions. Have a blessed day!!! 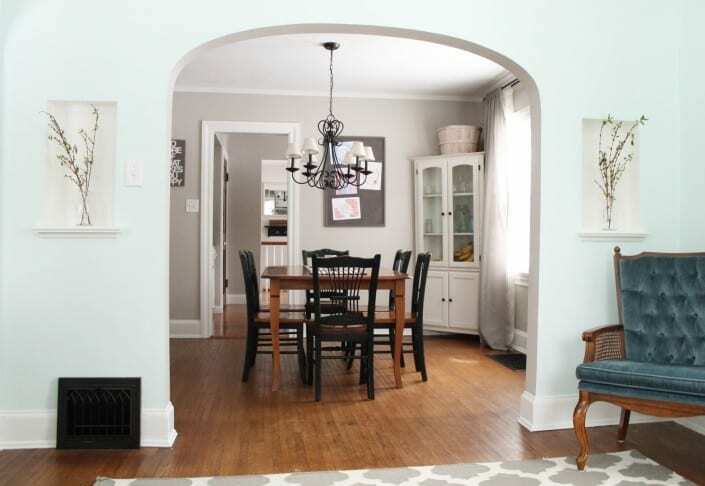 Love the huge change the paint and larger wall art made in your dining room. Great job!! Have you thought of painting your chairs white as well. 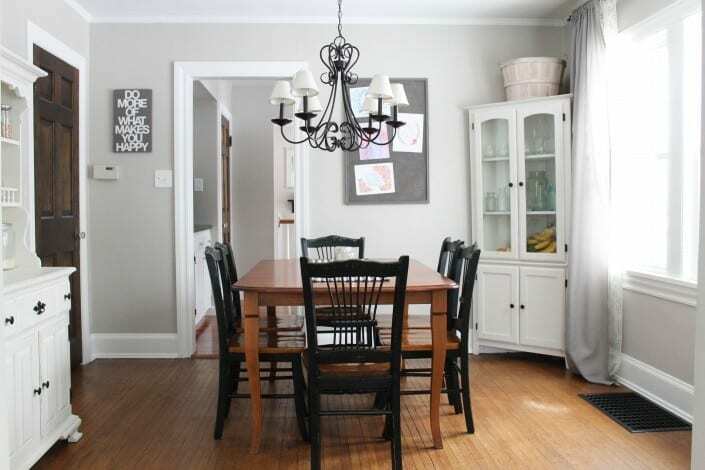 I love the wood table, but think white chairs would work better with the white hutches and trim. Just my opinion. Beautiful! This might be a silly question (since no one else asked it), but what kind of adhesive did you use for the burlap? I am ‘SO doing this! I have an old ratty looking cork board that I’ve been meaning to put up in our dining room, and this is just the make-over it needs!! Not a silly question at all! I used spray adhesive. Looking back, I liked that it was fast to apply and when I do it again, I’ll use the spray adhesive again. BUT! It left a super sticky burlappy mess on my hands. It cleaned up easily and then that was done but be aware of it. Almost a year later the bulletin board held up great! In fact I’m looking at it now, haha. 🙂 I’m going to make a white one for our entryway as well. Thanks for taking the time to comment! Good luck and let me know how it goes. Nice post and GFM Painting paints nothing but museum quality oil paintings reproduction reflecting the quality of the original artist artwork. Every painting is hand painted by skilled artists and we do not use digital printing techniques like glicee printing. Oh, that is a great take on a bulletin board! 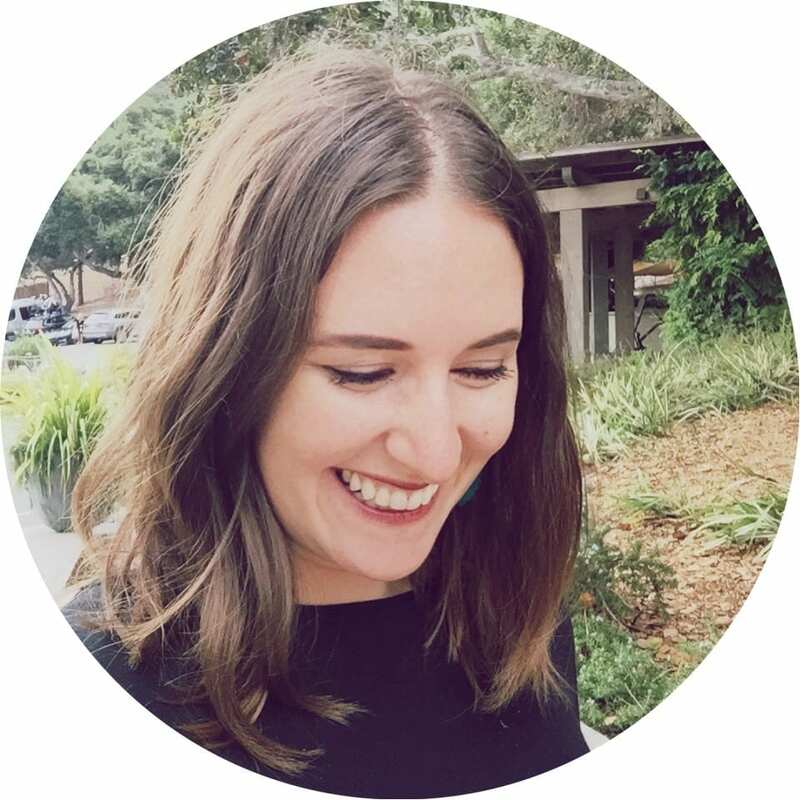 I wouldn’t have ever thought of using bulap – it’s a nice way to add texture to something that is often utilitarian and not-so-pretty. I adore that you have the “Tomorrow is fresh with no mistakes on it” quote on your board. Anne of Green Gables is one of my favourite characters ever! Painting the trim was the way to go! I can’t believe how much it transformed your room! Well done! Thanks so much for asking, this was fun 🙂 and you reminded me that I have no baby room inspiration pinterest boards!! AHHHH!!!! Must. Go. Make. One. Your mother and I never loved each other. knick knack patty whack give a dog a bone? Ooo, fancy! 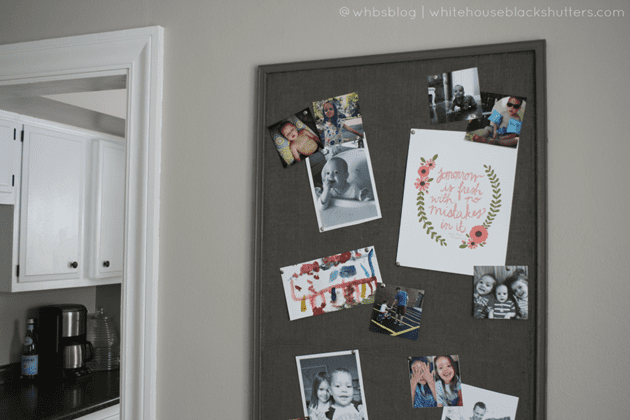 Love the painted trim and of course, the bulletin board!! My own site said I was spam this morning, if that makes ya feel any better about getting flagged. So weird! I see nothing spammy about your comment, I’ll go put my filter in time out. It is amazing the difference white trim makes! Love your board. Nothing better then the joys of your life surrounding you :). Agreed, it makes me happy to see them up there 🙂 Thanks, I’m happy it’s done, haha! The dining room looks beautiful! 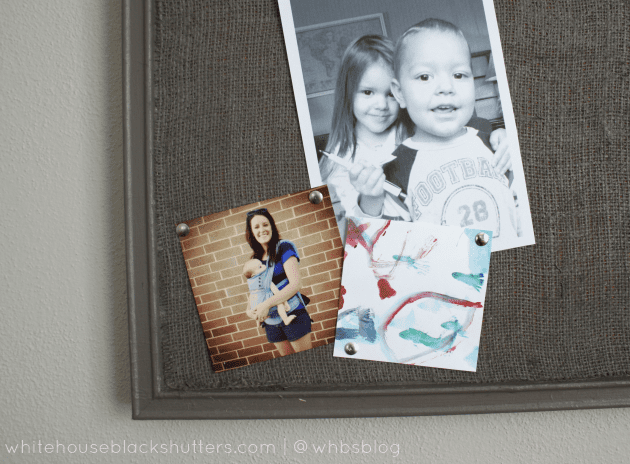 And I love the cork board. You did a great job! The room looks great! It’s amazing what paint can do 😉 I especially like the photo board, I never would have thought to paint the burlap. Thanks for sharing for the Pinterest Challenge!! thank you, Elizabeth! It really is amazing, and we see it time and time again but it still is a huge surprise. 🙂 I’m happy you came over to say hi, have a great day! Uh. You’re house is like the cutest thing ever!! and you are like the sweetest person ever 😉 thanks, Stacia! I love it! It’s everything wonderful! I also love anyone that uses the word “honkin'”. It’s one of my favorite adjectives. 😉 AND…I love the jars on the bottom of your hutch. Just picked up four at ReStore last weekend. (I already had one.) Anyway…you get my vote! 😉 k.
It really looks like a totally different room. Amazing! Wow! It looks so good! Nice work!! What a transformation! 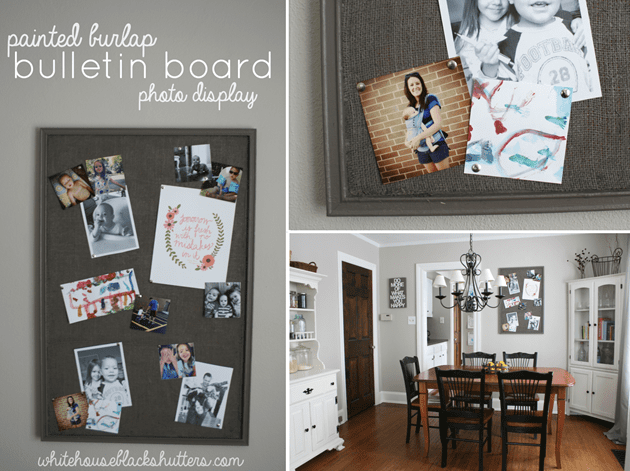 I really love that burlap bulletin board. thank you, Melanie! I feel like I want to start slapping it up all over the place, haha. It really adds nice texture. I never would have thought of painting burlap. But it came out great! Maybe helps cover up that horrible burlap smell that fabric usually has too. Totally love the new family board. 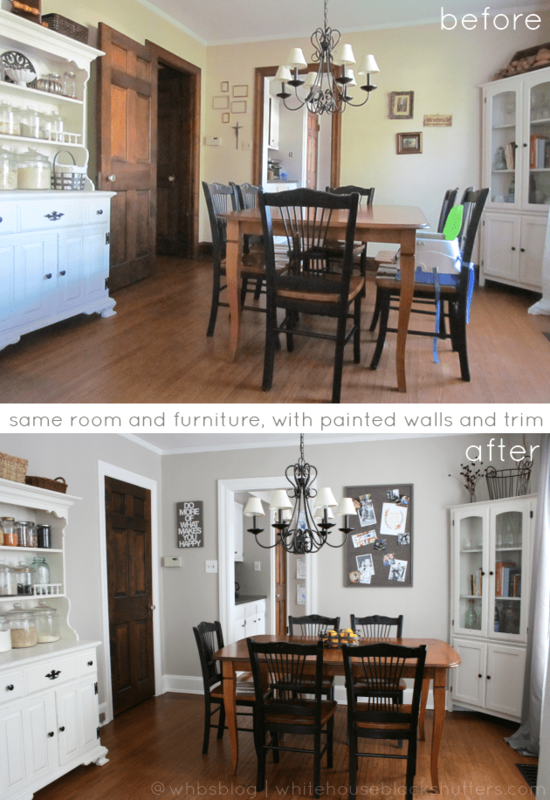 And the before and after of the room painted….WOW! What an impact a small change can make. I really want to hang the cross back up. Maybe on the left wall? Or maybe it went to an even better place. But LOVE the changes, otherwise! Great job. Got to be happy with that! yes! good call on the cross, I have a nail in the wall waiting for it next to the other hutch. 🙂 Thank you for mentioning that, Laura. I forgot to take it out after we painted!! What an update!! It looks so great! !